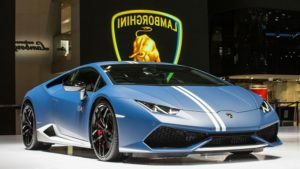 2018 Lamborghini Huracan is a sports car manufactured by Automobili Lamborghini. The successor of the Gallardo made its official debut at the Geneva Motor Show 2014. 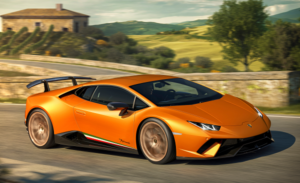 The Lamborghini Huracan 2018 is manufactured at the Lamborghini factory in Sant’Agata Bolognese. 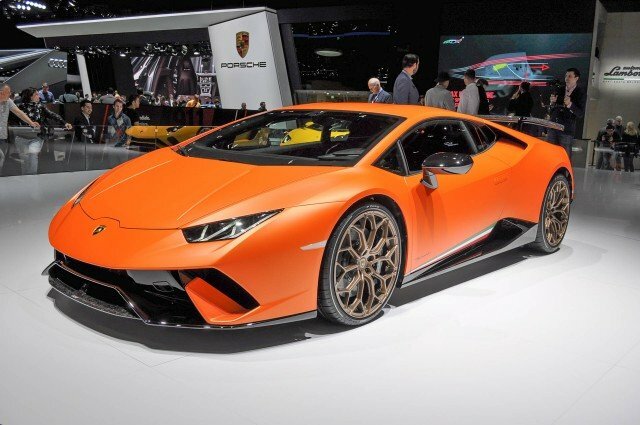 The Lamborghini Huracan deliveries to the first customers took place from spring 2014. The Huracán uses the same engine block as the previous Gallardo, a 5.2-liter V10. The changes introduced allowed to increase the power of the 520 hp of the Gallardo LP-520-4 to 610 hp. The Huracan accelerates from 0 to 100 km / h in just 3.2 seconds and reaches the mark of 200 km / h in 9.5 seconds. It is possible to drive the car in three modes, they are Strada, Sport, and Corsa that modify the behavior of the car. The seven-speed gearbox is automated from a single clutch. The design of the Huracan is, like all Lamborghini models of recent years, characterized mainly by sharp edges and an aggressive appearance. Responsible for the design was Filippo Perini of Lamborghinis own design studio Centro Stile Lamborghini. The instrument cluster is designed as a 12.3-inch TFT color display with an image resolution of 1440 × 540 pixels. The display is based on the Audi virtual cockpit, which was first used in the Huracán and a short time later appeared in the Audi TT 8S. Lamborghini Huracan 2018 model reproduces a large part of the vehicle information that is important to the driver and adopts the three-dimensional map display of the navigation system (Lamborghini Infotainment System = LIS, a version of Audi MMI adapted to Lamborghini). LIS uses a Tegra 3 processor from Nvidia. A narrow display in the center console shows engine oil pressure, temperature and battery voltage. The sports seats, which can be individually configured by the buyer, are covered with Nappa leather and Alcantara. The 2018 Lamborghini Huracan Hybrid chassis of the Lamborghini Huracán consists of a structure made of carbon fiber reinforced plastic “carbon” and aluminum elements. With a dry weight of 1,422 kg, the vehicle achieves a power to weight ratio of 3.17 kg / kW (2.33 kg/hp). The 5.2-liter V10 engine, as in its predecessor Gallardo, develops a maximum of 448 kW (610 hp) at 8,250 rpm and a torque of 560 Nm at 6,500 rpm. Incidentally, the IDS (Iniezione Diretta Stratificata) direct injection system – together with the world’s first V10 engine ever  – combined with intake manifold injection (MPI) achieves more power and torque at fuel consumption and emission levels that are in line with the Euro 6 standard Meet standards. The top speed is 325 km / h, while the acceleration from 0 to 100 km / h in 3.2 seconds and from 0 to 200 km / h in 9.9 seconds. The performance of the V10 is transmitted to the wheels via the Lamborghini Double Lamborghini (Lamborghini Doppia Frizione) engine connected to the electronically controlled four-wheel drive. On the 2018 Huracan, various driving modes can be accessed by means of an adaptive network intelligent control (ANIMA), with three settings available: STRADA, SPORT, and CORSA. The various settings affect the operation of various systems, such as engine and transmission responses, vehicle sound, four-wheel drive and electronic stability control.